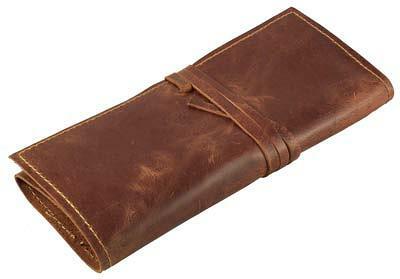 Which pencil case wrap is best for artists? As an artist, you need to know what to keep in your pencil case and exactly where everything is. 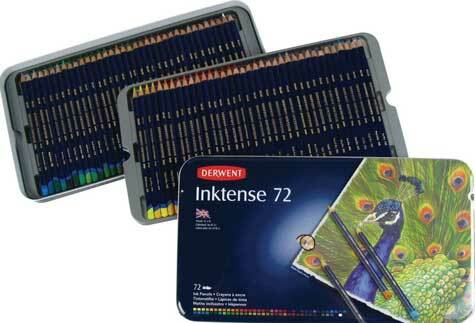 Gone are the days when plastic pencil boxes ruled the world. Hard cases can be difficult to transport with their box-shaped awkwardness. If you drop it, it spills open and your pencils go flying. 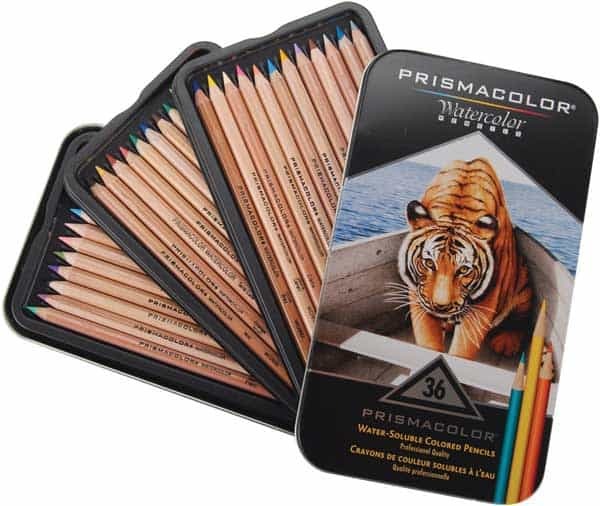 These cases we reviewed below are great for artists, architects, and writers, but they are also good pencil cases for high school students who may be taking an art class that requires a plethora of colored pencils and art supplies. 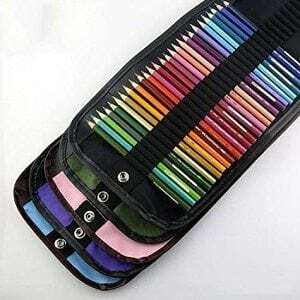 If you have pencils for every color of the rainbow and then some, wrap them up in this canvas case that has 72 slots. It opens like a book with each side containing a thick piece of elastic which is divided into individual slots for pencils. There are even a couple of bigger slots if you need a place to stick your block eraser or sharpener in their own individual compartments. When you need a pencil, unroll it – all of your pencils are on at your fingertips without the fear of them slipping away. When you’re done, just roll it up and secure it with the faux leather ties and metal snap button. It weighs just less than a pound, and measures 19.6 x 15.7 x 0.2 inches. It’s lightweight, portable, and stylish. The main material is black with brown faux leather trimming which gives it that cool pencil case design while maintaining a unisex versatility. For those who want an even cooler pencil case design with more of a grown-up feel, this high quality case definitely has it. Made of genuine leather and a hand-stitched design, it has a classic stylish look and feel while remaining affordable. 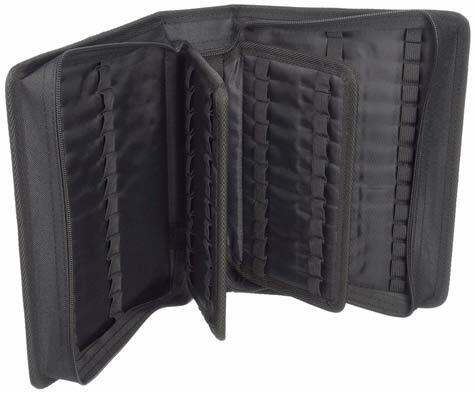 It folds open to lie flat, revealing seven stitched slots and one larger square slot. 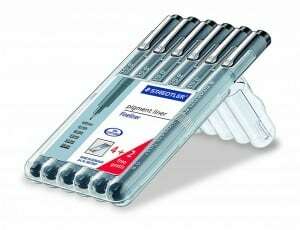 Insert your pens and pencils into the thinner slots and whatever other odds and ends can be stored in the larger one. 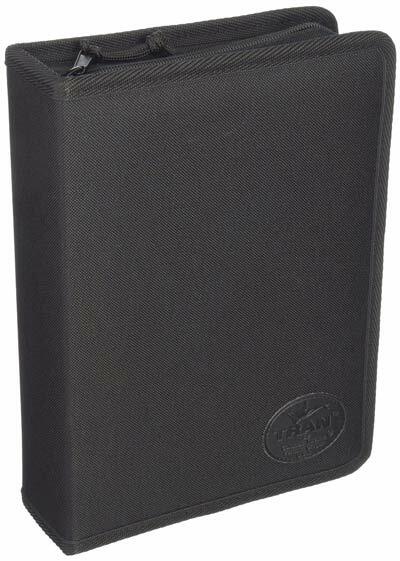 Being real leather makes it a little heavier than the other cases we’ve mentioned, but it’s still lightweight and portable at just over a pound, and measures 8 x 1.5 x 3.2 inches. Fold it in thirds, then wrap the leather thong around it to secure it shut. There are no flaps on the edges to protect the tips of the pencils, but there’s enough head room that it shouldn’t be an issue for a standard sized pencil. This is more of a bag unto itself than a pencil case. But it was designed to hold not only 132 pencils, but all of your other materials as well such as notepads, markers, erasers, and other things too big to fit into a small case. Inside, there are three areas called “pencil leaves” that hold 44 pencils each. Each leaf can be adjusted, thanks to the six snap rings, so you can change the storage size to fit your individual needs. There’s even an exterior mesh pocket for more storage space. 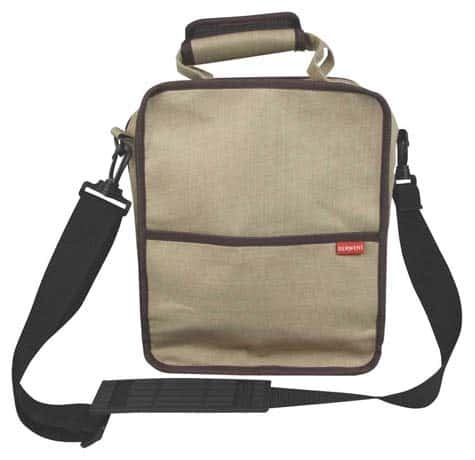 It’s made of washable canvas material, and it comes complete with two carrying handles and a removable shoulder strap to ease portability. 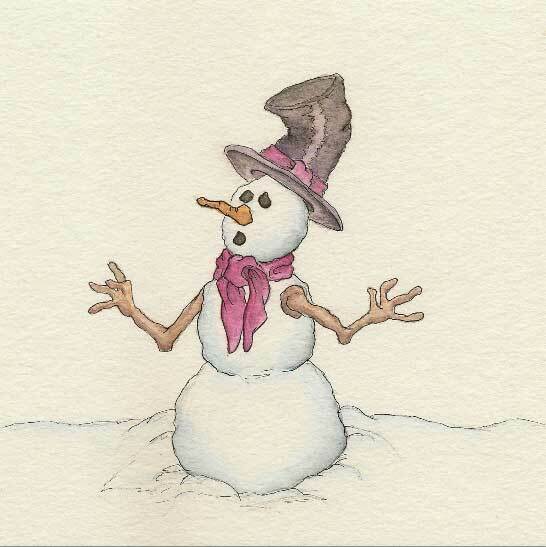 It measures 8-1/2 x 10 x 4-1/2 inches, and weighs just over a pound. Fill it up with your stuff, zip it shut, and you’re ready to go. If you’re looking for a pencil case that can fit nicely into your bag, this isn’t it. 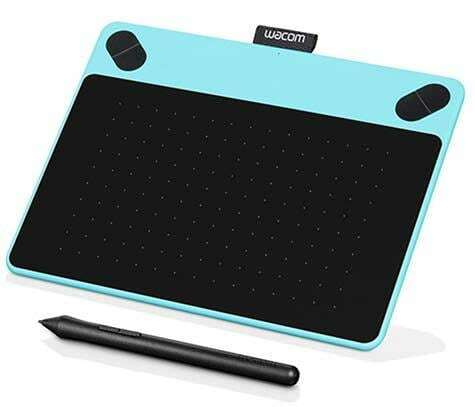 But if you need a comfortable mobile solution for an artist who needs to cram every pencil and tool they have into one portable case, this is the answer. 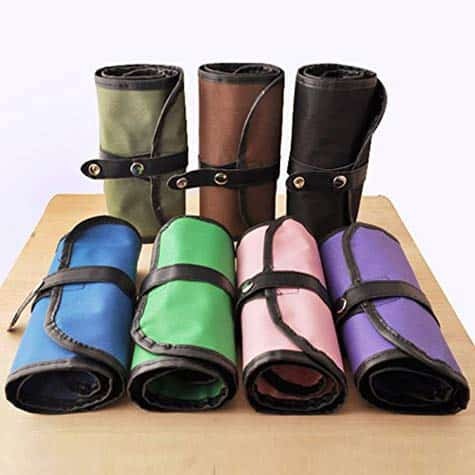 Able to fit 36 standard pencils comfortably, this canvas roll-up pencil case was designed to carry and protect your pencils. Rolled out flat, it’s a rectangular flexible material with upper and lower flaps on the inside to protect the tips of the pencils. 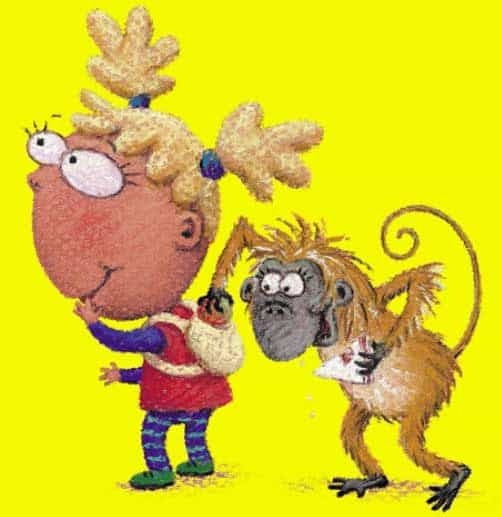 Slip the pencils in the pre-stitched elastic bands, roll it up, and snap it closed. There’s a larger sized elastic holder for a block eraser. A metal pencil sharpener is included and has its own distinct place where it stays securely nestled. Once rolled up, wrap the leather strap tie around it, and snap it shut. If it gets dirty, it’s completely washable. It only weighs a pound, and it measures 19.5 x 8 x 2 inches. It’s big enough to store your pencils, but not too big to fit in your bag. If you have larger pencils or thick markers, they won’t fit in the elastic enclosures. But if you snip the piece of thread between two slots, it now becomes one big slot that could accommodate a larger marker. 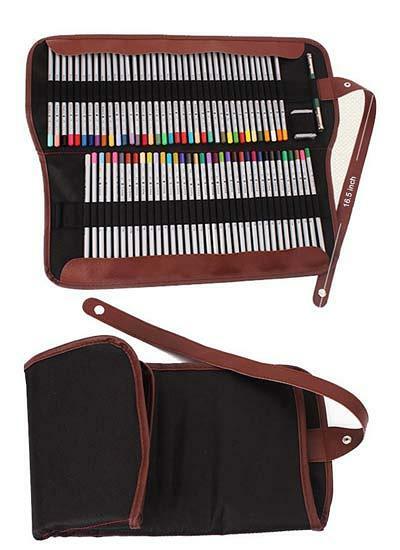 Speaking of cool pencil case designs, this waterproof binder-like case is stylish and can hold up to 120 pencils. Pack it full, and don’t worry about anything slipping out since it has a fully encompassed heavy duty zip-around design. It lays flat to give you full access to your tools while fitting them snugly in their elastic niches. The slots are made wide enough to hold two pencils each. It measures 14.5 x 3 x 8.5 inches and only weighs a pound. It’s made out of 1,800 denier fabric which makes it the ultimate water repellent case. It’s outstanding organization and safety storage for all of your supplies. If you’re looking for a case that has durability, convenience, and a cool pencil case design, you can surely find one that catches your eye out of these that we’ve listed. 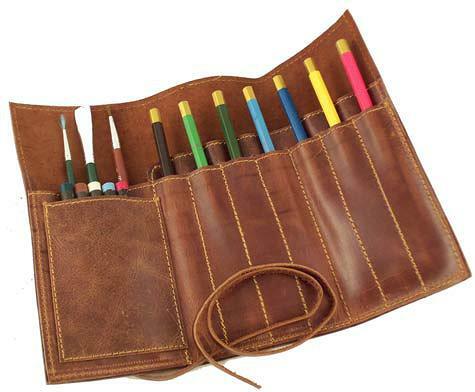 For the serious artist, the Rustic Genuine Leather Pencil Roll has that authentic chic handmade feel while serving its purpose of organizing, storing, and transporting your pencils and supplies. A good pencil case for high school students may be the WooCrafts Canvas Pencil Wrap case. 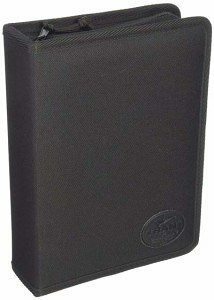 It holds a good amount of pencils while delivering premium faux leather quality with a handsome unisex design. 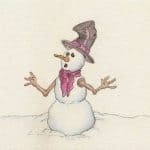 Great gift Ideas for artists and cartoonists	Which are the best soft chalk pastel brands for artists?